If you or your child has been the victim of any threats or acts of domestic violence by any family or household members, you may likely want to seek a protective order against the abuser in order to protect yourself and your family from future harm. Experience St. Charles family lawyer Kenneth P. Carp can help you secure a protective order to keep you safe. To schedule a free consultation with attorney Kenneth Carp, call our office today at (636) 947-3600. There are two main types of protective orders available in St. Charles and surrounding areas: an ex parte order and a full order. An ex parte order can be obtained immediately after an episode of domestic violence, without the appearance of the abuser, and even if the courthouse is closed on nights, weekends, or holidays. This type of order can prohibit an abuser from entering your home or contacting you in any way, can give you temporary custody of your children, and may include other provisions the judge finds necessary for your specific situation. A full order of protection may later be granted after a full hearing in court and may grant you custody, temporary possession or property, child support, and other protections. However, your abuser will be notified of the hearing, will have the opportunity to present evidence to the court, and will likely have their own attorney to fight against the protective order. For this reason, it is always important for you to have a qualified lawyer on your side. Domestic violence situations are usually frightening for all involved. Of course you want to do your best to protect the safety and well-being of yourself and your child, so you should never wait until the situation escalates further to take action. Instead, contact a dedicated family law attorney who knows how to take immediate steps to secure a protective order to help keep you and your family safe from harm. His concern and expertise is best exemplified by his involvement in establishing the ground breaking Domestic Violence Court in St. Louis County which provides special attention and pro-bono representation in cases where elements of domestic violence are alleged. 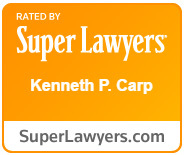 St. Charles lawyer Kenneth Carp knows how serious and sensitive domestic violence matters may be, and will provide the highest quality of care in your case. Please feel free to call (636) 947-3600 for assistance today.